We first reported on Enfys Nest in March, when new merchandising details revealed this character is the villain. Enfys Nest is just the latest character from the Star Wars Legends canon, previously known as the Expanded Universe, to be plucked out and placed into the Star Wars canon, after the character's first introduction in the Star Wars Marvel comics from the late 1970s. The merchandise revealed that Enfys Nest is the leader of the Cloud-Rider gang who terrorize the skies with "swoop bikes," but a report from last month claimed that Enfys Nest is a female, which lead to many speculating that this character, whose face has not been shown yet, is actually Qi'ra (Emilia Clarke) in disguise. This clip just debunked that theory, since Enfys Nest and Qi'ra are seen in the same place at the same time. The clip features Han Solo (Alden Ehrenreich), Tobias Beckett (Woody Harrelson), Chewbacca (Joonas Suotamo) and Qi'ra all surrounded by Enfys Nest and this villain's thugs, and as Han Solo and Beckett step out to face him, Han unsnaps his blaster holster, but Beckett tells him simply, "Don't." While we still don't get to see Enfys Nest's face, we do hear this character speak, and while it could be a female disguising her voice (like Leia in Return of the Jedi), it does sound like a male character. Enfys Nest states that Beckett must have known he'd see Enfys again, to which Beckett responds to by stating that he was "counting on it," although he wasn't expecting it to happen so soon. When Beckett adds that Nest "has a problem," Solo unexpectedly takes over, stating that, in that "freighter" down there, as he points to the Millennium Falcon, are "about 30 hired guns," and all he needs to do is snap his fingers, and Nest's crew will be surrounded. Han's bold bluff backfires, though, when, soon after making this proclamation, the Millennium Falcon takes off without them. Shortly after the rumor surfaced that Enfys Nest was a female, an officially licensed Star Wars magazine made reference to Enfys Nest as a male character, but until that mask comes off, if it ever does, we likely will never really know for sure. 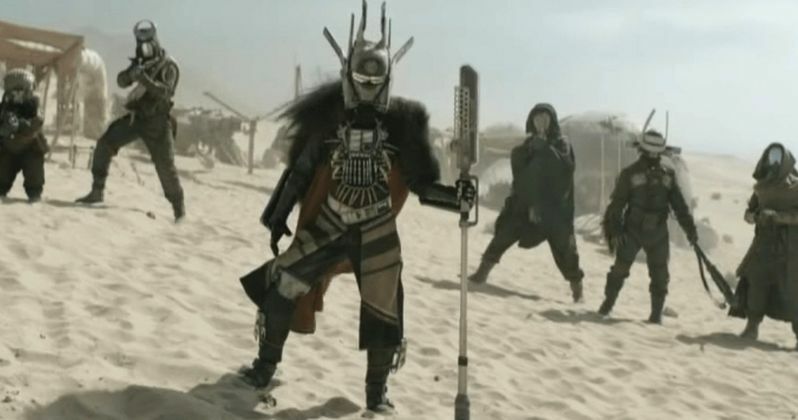 Enfys Nest is believed to be the primary villain in Solo: A Star Wars Story, but whether or not he or she is ever unmasked during the movie remains to be seen. While we wait for more on Enfys Nest's gender, take a look at this new clip, courtesy of Star Wars YouTube, which confirms that Enfys Nest is, if nothing else, most definitely not Qi'ra in disguise.